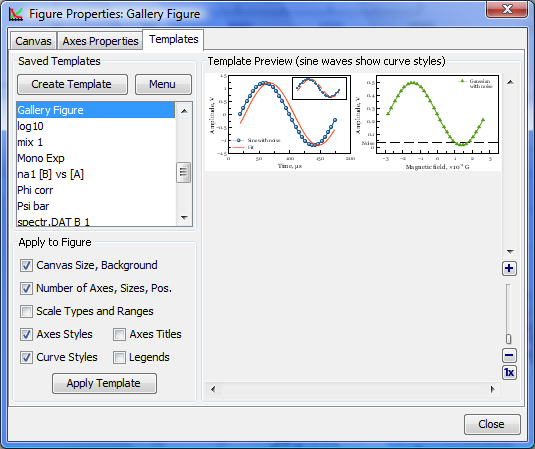 Figure Templates is a powerful tool for reusing axes layout of previously created Figures. To use Figure Templates, open Figure Properties window and select Templates tab. Templates are stored in a special folder in your operating system account profile. Project files do not contain templates; changes in Projects do not affect Templates. To create a template from Figure open the Figure Properties window, select Templates tab and press 'Save Template' button. Then enter the new template name in opened dialog window. MagicPlot always saves all available information in the template (not regarding on checkboxes state). To apply template to figure open the Figure Properties window and select Templates tab. Select desired template in the saved templates list. Then check or uncheck boxes with features to apply and click on 'Apply Template' button. When you apply a template to Figure, the properties are copied from template to Figure. Note that the Figure style will not be changed if you change the template after you have applied it to Figure. The project file is standalone and you do not need the template to open project. You can undo applying template in a standard manner (no need to close the Figure Properties window).